Can cancer be prevented with a vaccine? The human papillomavirus (HPV) vaccine represents a tremendous public health breakthrough. WHO recommends that all girls aged 9–14 years receive 2 doses of the vaccine. Over 270 million doses of HPV vaccine have been administered worldwide so far, and the impact of the vaccine is clear. 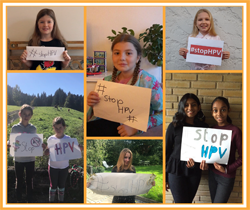 Rapid reductions of up to 90% in HPV infections and genital warts in teenage girls and young women have been demonstrated by studies conducted in Australia, Belgium, Germany, New Zealand, Sweden, the United Kingdom and the United States of America. Along with effective cervical cancer screening programmes, reductions in HPV infections will dramatically reduce cases of cervical cancer and resulting suffering and death. HPV is a group of viruses that infect the skin or various mucous membranes (such as in the mouth or cervix). Common types of sexually transmitted HPV can cause cervical cancer in women as well as genital warts and other cancers in men and women. HPV is easy to contract and pass on to others: about 80% of people will be infected with one or more types of the virus at some time in their lives. Most HPV infections in the cervix do not cause any symptoms. The infection usually lasts 1–2 years and goes away on its own. However, at least 1 out of every 10 such infections becomes longer-lasting, and can develop into precancerous growths. If these growths are not detected and removed on time, they can develop over several years or decades into cervical cancer. To date, 37 of the 53 countries in the European Region have introduced the vaccine into their national routine immunization schedules. Vaccinating all girls against cervical cancer will also indirectly prevent most boys from contracting the virus. However, several countries also offer the vaccine to boys to ensure their direct and immediate protection from genital warts and forms of HPV-related cancer that affect both men and women.